New Caledonia’s mangrove swamps occur mostly on the western coastline of Grande Terre, and are part of lagoon habitats and estuaries (places where rivers meet ocean tidal waters). Mangrove swamps account for 80% of the island’s western coastlines and are an important ecosystem for New Caledonia. Around 25 plant species occur in the mangrove forests but none is endemic; as a result, mangrove plants are not part of the Garden’s New Caledonia collection. Nevertheless, the mangroves are a vital ecosystem for the islands. They protect the coastline when cyclones and tempests visit the islands, and they act as a buffer between the lagoon and mountain mining areas that are heavy in metals toxic to plants and other life. Mangrove trees grow with their bases submerged in water and have adaptations that allow them live in inundated, salty conditions. Given their importance, here are a few profiles of mangrove swamp species. Rhizophora species (Rhyzophoraceae) have roots that emerge from their branches and form stilts. This root structure braces the plants against ocean swells and currents. Rhizophora trees are predominant in the areas where the mangrove meets the sea. In the central zone, in estuaries and at the mouths of rivers, grows a smaller mangrove species, Avicennia marina (Acanthaceae) or grey mangrove. All plants need oxygen to live, and growing in inundated conditions requires some adaptation. Avicennia have aerial roots called pneumatophores that emerge out of the mud and absorb oxygen. Arial roots (pneumatophores) of the grey mangrove, Avicennia marina var resinifera – Barker Inlet, South Australia. Photo Peripitus. The adaptations in the root structure of these two mangrove species have also been shown to filter the heavy metals released by the mining and smelting operations on the island. 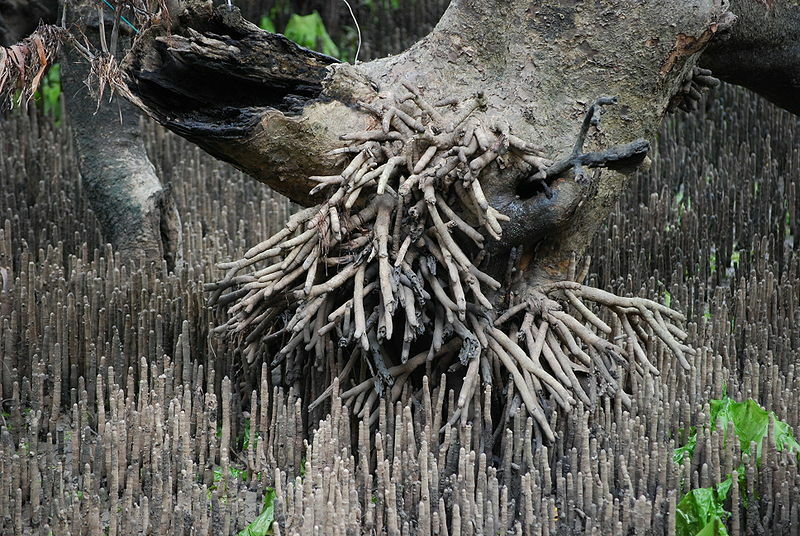 In the elevated roots of Rhizophora trees, litter accumulates in the sediment and metals combine with decomposing organic matter, which are taken up and trapped by the mangrove. The Avicennia‘s pneumatophores extract oxygen from the atmosphere and lose some of that oxygen to the sediment. As a result, metallic elements linked to iron oxides are dissolved and transferred to the mangrove trees. In this way the mangrove protects the coast from the tropical tempests and cyclones that visit the region and also buffers New Caledonia’s beautiful and biodiverse lagoons from toxic effects of the iron, manganese, nickel, chrome, and cobalt and that leaches down from the mountain mining areas. Unfortunately New Caledonia’s mangroves are decreasing in size due to urbanization along the coastlines. They are also susceptible to herbicides and other agricultural pollutants. 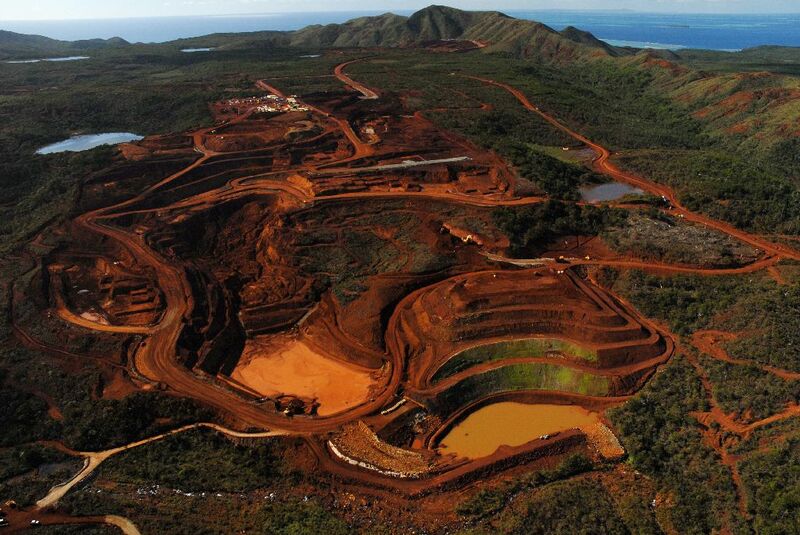 Goro mine, New Caledonia. Photo Julien Thomazo. Institut de Recherche pour le Développement (IRD). 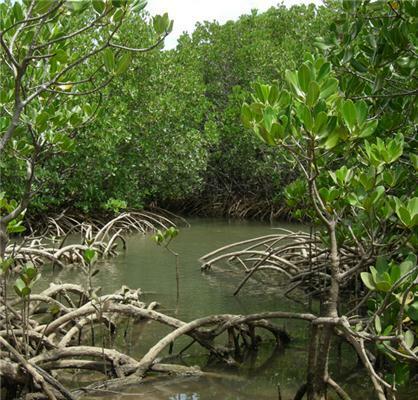 “Mangroves: A filter for heavy metals.” ScienceDaily, 24 Jul. 2012. Web. 15 Oct. 2013.